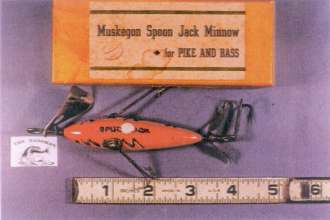 Jacob Hansen made the Michigan Life-Like and Spoon Jack minnow. 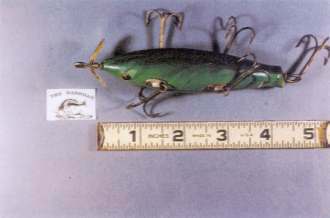 February 20, 1908 he was granted a patent. 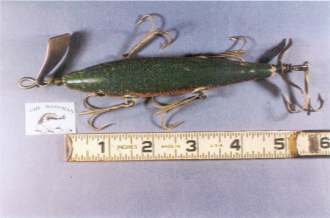 Hansen sold the Michigan Life-Like to Adolph Arntz early in the century (c.1910) who owned a sporting goods store in Muskegon, Michigan. 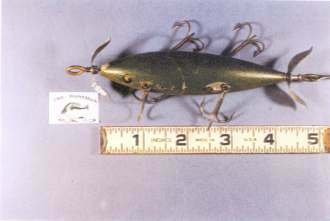 Arntz abandoned the Life-Like lure and bailed out just a few years later because this lure was to difficult to make. 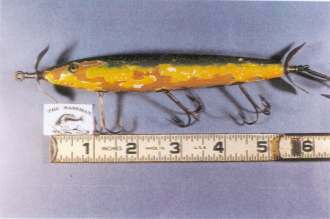 The Life-Like Minnow was made in two versions. 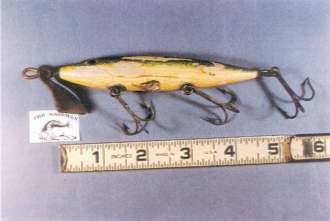 The 2-3/4" version had three treble hooks and the larger 3-3/4" had five treble hooks. 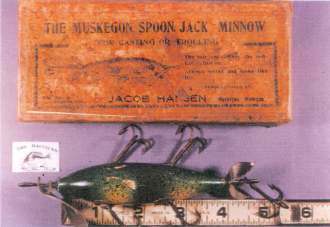 Jacob Hansen began making the Spoon Jack Minnow about 1915 and continued making them through 1932. 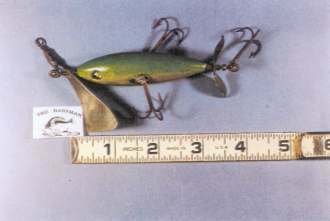 Hansen was known to be an tinker and it seems he couldn't keep from changing his lures. 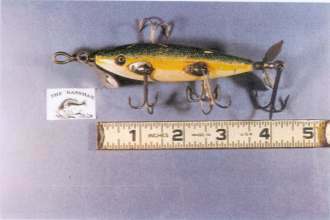 With Hansen lures almost anything could happen because he made this lure with different hook combinations, several different props and many different hook hangers along with a variety of colors. 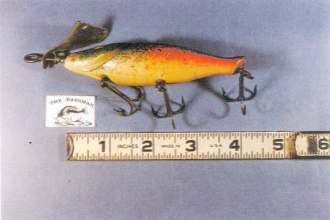 Jacob Hansen was a innovative lure manufacture and he died in 1945. 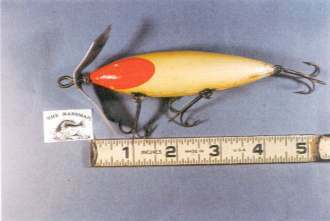 Clarence Zahn close friend of Clyde Harbin Sr. and old lure mentor lived in Ann Arbor, Michigan. Mr. Zahn and his wife, Shirley gave Mr. Harbin a place to stay while visiting many Northern NFLCC lure swap meets that were held in that area. 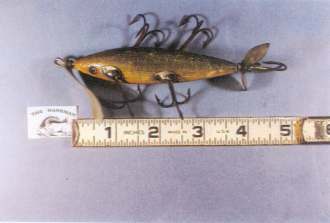 Their kind treatment enabled Mr. Harbin's collection to grow and his lure knowledge increased because of his exchanging or buying lures from Clarence Zahn. 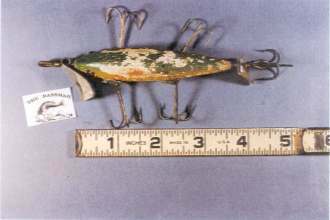 You see Clarence is a great gentleman and will share his lure information and is a different person in behavior or manner than Clyde Harbin. It is said that the swap or barter sessions got so loud and intense that other collectors waited until they met and gathered in their room for the action to take place. 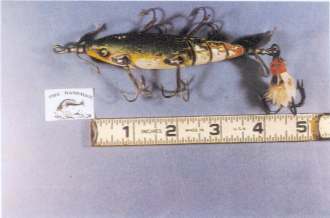 Mr. Harbin said it made their day and increased their lure collections and finally they met behind closed doors to exchange lures. Today with their collections sold to others, they talk about the great times they had and thus to enjoy each other. They both now have computers and e-mail each other often but now wish they would have purchased computers long ago and saved on the huge phone bills. Now Mr. and Mrs. Zahn reside in Traverse City, Michigan. 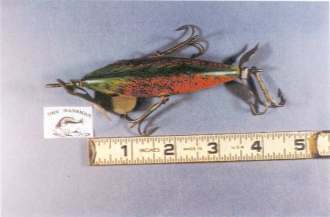 Acquired by Tim Watts. 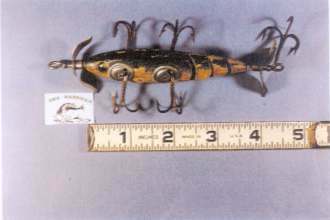 A Grandson's gift to Clyde A. Harbin Sr.
Reproductions Courtesy of Clarence Zahn, Tim Watts and Clyde Harbin Sr. 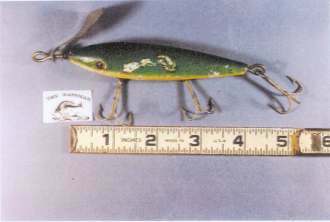 The Hansen lures in these photographs did reside in the Famous Clyde A. Harbin Sr. Collection but since then the Jacob Hansen lures have found a new home and moved to The Tim Watts collection.